The latest news from the OLPC world are no news. So, the OLPC is now more or less officially and primary a laptop project – not an education project. Why I am not surprised? I think publicly traded technology companies suddenly making add-value for the children of the developing world instead of their shareholders would have been not only news, it would have been a revolution. Don’t you think? I like when things are simple, fair and transparent. I do not have anything against business, companies or making money. Business is simple. You design a product or service people want and can afford. Many companies are good in this. Let’s think for a moment about OLPC’s XO as a product. I think the main problem of the XO is that it is a PC, a personal computer with very limited connectivity. I think people do not want PCs. The time of PCs is simply over. The ecosystem of hardware and software providers needs PCs much more than the people. The same simple problem is the main problem with all the low-cost ultraportables, now offered for education. They are potentially great for the software business ecosystem but not necessary so good for the education and learning ecosystem. They are PCs! Still, what it comes to the PC / software industry, I think OLPC’s XO made some brave moves to the right direction. With its’ Sugar interface (Linux GUI) users are not using programs or software but performing activities, such as chatting with someone, browsing web with someone etc. This approach fits well to education and learning world, where people are not interested in to “run software” (or to be run by a software). In education people are interested in to do things. Actually, I think this is not only an issue of computing for education and learning. I think the whole computer usage is moving from the “doing things with software” to the direction of simply “doing things”. This kind activity centered computing is not exactly new idea, either. All ready the Xerox Star (1981) was based on the idea. In the Xerox Start there were objects you were working with. Clicking an object would simply open it in an appropriate application without user even knowing what software she is using. As a user you were never launching any software. Also mobile phones have always been activity centered: to make a phone call or to send a message you make a phone call or send a message. You do not start an application to do these operations. Apple computers’ OS have always been balancing between the activity and application paradigms. With the iPhone’s OS they have obviously moved some degree more to the direction of activities, however, no with the SDK they took another step back to the software ecosystem. I wonder was it because of the pressure from the Apple software developers. So, what would then be a better approach to design a device for school and educational use, if the PC / software model is not the right one? My answer is a web browser with all possible input and output methods, with ultimate network connectivity. 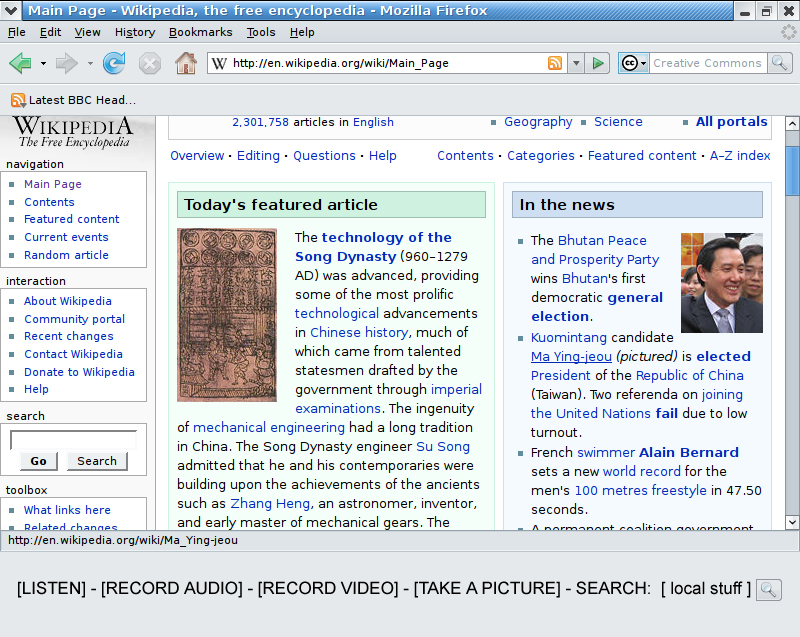 Inside the web browser you can run all the application and content you need in education. With all possible input and output methods I mean microphone, video/still image camera, keyboard, drawing pad, touch screen, handwriting recognition, and voice recognition with text to speech and voice to text. The ultimate connectivity means that the device is able to operate in all the available wireless networks from Bluetooth to GSM to EDGE to 3G to WiFi. Actually the connectivity is the key. I think in OLPC’s XO – as in all the low cost school laptops – the poor connectivity (WiFi) is the main problem. People need to be connected – always. So, here we have the hardware and software specification. For the user the only visible “software” should be simply the web browser. Everything else should run in a background without user paying any attention of the applications that are actually working behind the scene. To explain this I made a mock-up of the UI. Right, it is simply a web browser with some things you can do with the device. The options fit in a one line under the broswer window. An important feature is an universal search in the end of the row. That is the only way to call your “stuff” from the device. No file management, no folders, no files. At the moment the devices that are closes to this kind of functionality are the iPhone and the Nokia N810 – also called Internet tablet. The advantage of the iPhone is that it comes with the WiFi and GSM/EDGE (at some point 3G). Nokia Internet tablets do not have any mobile network connection except over Blutooth and separate mobile phone. This makes using the device simply too clumsy and complicate for school and educational use. Students need to get online always, wherever they are, seamlessly. Now you are probably asking how pupils, parents or schools will pay for the mobile carriers the costs of data traffic in mobile networks? A good thing in the case of schools is that in most countries schools are primary ran by the governments who also controlling the frequencies where the mobile carriers are operating their networks. The governments could simply provide the license for those operators who are making the best deal of flat rate for educational / school use of their mobile networks. I think the governments have all the aces in their hand. The challenge is that in a very few country the ministries responsible for telecommunication (frequencies) and ministries running schools hardly talk together – not to mention structural corruption taking place even in the most democratic nations of the world, in a form of lobbying politicians and government officials. I really like this. It resonates with the Peoples-uni (http://peoples-uni.org ) which uses Open Educational Resources in an educational context, rather than just creating them. Peoples-uni looks very interesting. Thank you for sharing the link. Peoples-uni could partnership (or simply just take in use) the platform and resources provided by the Wikiversity.